A Lonely Grave: The Life And Death Of William Redmond is the fascinating biography of a hitherto forgotten man who in his time came to represent the ambition, frustration, and self-sacrifice of a generation of Irish patriots who sought home rule for their country in the days preceding World War I. In the early morning of 7 June 1917, the Catholic and Nationalist 16th (Irish) Division advanced side-by-side with the Protestant and Unionist 36th (Ulster) Division to take the Messines Ridge, south of Ypres. That evening, in a field hospital of the Ulster Division, an officer of the 16th died of wounds. He was Major William Redmond the brother of John Redmond, leader of the Irish parliamentary party. Willie Redmond had been one of the most determined advocates of home rule for Ireland, yet when his brother called upon his supporters to join the British Army in August 1914, he was one of the first to enlist. His death in battle made a greater international impact than the death of any other British soldier in the Great War. Today he has been almost completely forgotten. 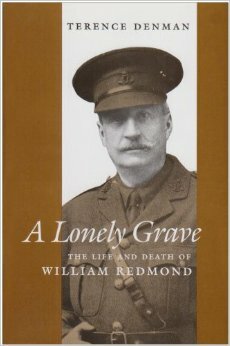 This biography, the first of Willie Redmond, covers both his political and military careers. Terence Denman has written two books on the First World War: Ireland’s Unknown Soldiers: the 16th (Irish) Division in the Great War (1992) and A lonely grave: the life and death of William Redmond. (1995), both published by Irish Academic Press. He has written articles for Irish Historical Studies, War in History and the Irish Sword, and has written the entries on William Redmond for the Dictionary of National Biography and the Dictionary of Irish Biography.